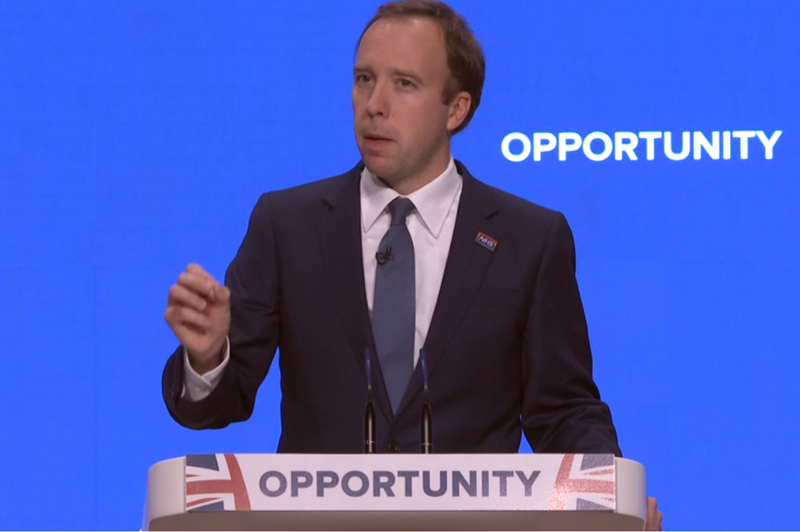 Health secretary Matt Hancock has discussed the impact of technology on children’s health and announced an ambitious intention to expand the current 100,000 Genomes Project. Speaking at the Conservative Party Conference in Birmingham this week, Hancock revealed that he is dyslexic, and said he might never have achieved career success without the use of spellchecker technology. The Health secretary admitted that technology could have a detrimental impact on the mental health of young people but added that it could also help them to succeed. “I think if Microsoft had invented spellcheck ﬁve years later it would have had a massive negative impact on my career. By the time I got to the workplace, everything was done on word processors and that solved my very serious spelling problem,” he said. The Health secretary issued a warning on the potential dangers of social media on children’s mental health, stating that the threat of social media on mental health is similar to that of sugar on physical health. He said that the chief medical officer (CMO), Professor Dame Sally Davies, is reviewing the impact that excessive social media can have on children’s mental health. Hancock said, “Overwhelmingly technology is a force for good, but we are seeing more and more evidence that children using social media sites for hours on end each day is having a detrimental impact on their mental health”. The CMO is expected to publish interim findings from the review in December. Hancock also announced his department’s intention to expand the current 100,000 Genomes Project, with the NHS and a medical research project called UK Biobank aiming to sequence one million genomes over the next five years. “Today’s commitments form part of our bold aspiration to sequence 5 million genomes in the UK, using ground-breaking technology to do this within an unprecedented 5-year period,” he added. The government aims to kickstart a genomics industry, aiming to make the UK a leader in the field. A report by the House of Commons’ Science and Technology committee, published in 2018, said genomics has the potential to transform medical care across the world and in the NHS as well as dramatically improve patient outcomes in the UK and globally, but currently, the digital infrastructures in the NHS are “not up to scratch”. The committee pointed out that the introduction of whole genome sequencing into routine NHS care will lead to growing volumes of genomic data being linked to medical data, raising issues around consent and access. “Genomics England should seek to maximise the commercial value of its datasets and continue to provide industrial and academic access to these data to facilitate the growth of the UK genomics industry and the development of new treatments, while ensuring consent and data safety safeguards,” the committee said. The UK is among the signatories of the European Declaration on linking genomic databases across borders. The declaration is an agreement of cooperation between the countries that are investing in providing secure and authorised cross-border access to national and regional banks of genetic and other health data, in accordance with all EU data protection rules. The declaration was originally launched on April 10 during the Digital Day and has been since then signed by Austria, Greece, Bulgaria, Croatia, the Czech Republic, Cyprus, Estonia, Finland, Italy, Lithuania, Luxembourg, Malta, Portugal, Slovenia, Spain, Sweden and the UK.